For a smart casual outfit, dress in a Balenciaga distressed double breasted coat and black chinos — these pieces go pretty good together. Grab a pair of white leather low top sneakers to make the getup current. 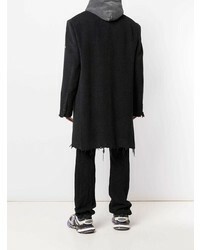 Wear a Balenciaga distressed double breasted coat from farfetch.com with beige wool dress pants like a true gent. Opt for a pair of burgundy leather casual boots to make the look current. 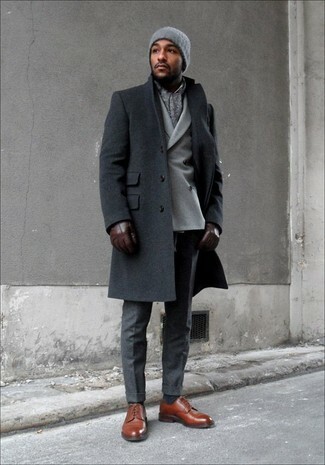 Wear a charcoal overcoat with black dress pants for a sharp classy look. You could perhaps get a little creative in the footwear department and dress up your ensemble with tobacco leather oxford shoes. 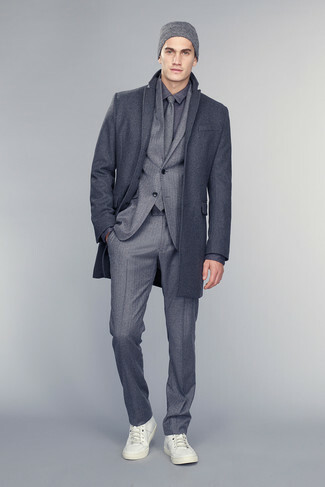 For a nothing less than incredibly stylish outfit, reach for a charcoal overcoat and charcoal dress pants. For something more on the daring side to complete this ensemble, grab a pair of brown leather derby shoes. 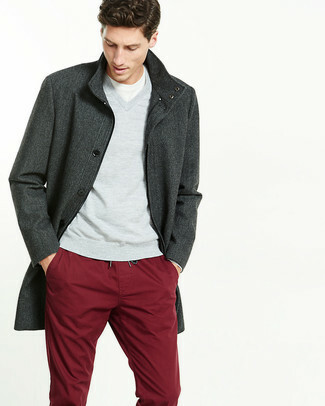 If you're looking for a casual yet dapper ensemble, rock a Balenciaga distressed double breasted coat with burgundy sweatpants. Both pieces are totally comfortable and will look great together. 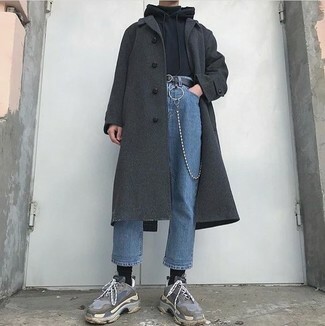 For a smart casual look, pair a Balenciaga distressed double breasted coat with blue jeans — these pieces a work setting beautifully together. Grey suede athletic shoes will add some edge to an otherwise classic look. 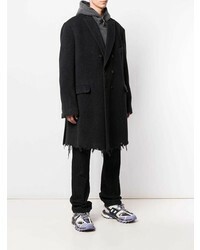 Consider pairing a Balenciaga distressed double breasted coat with charcoal wool dress pants like a true gent. 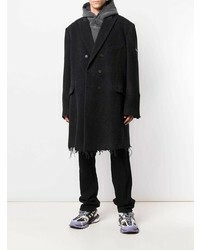 Marry a Balenciaga distressed double breasted coat with a grey vertical striped suit for a sharp, fashionable look. 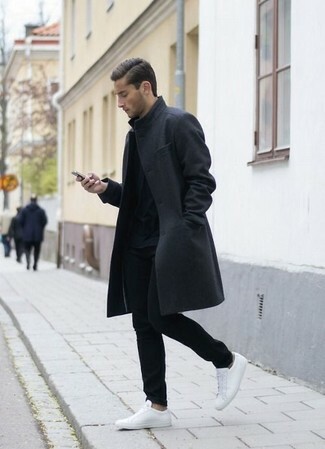 Go for a pair of white low top sneakers to make the getup current. 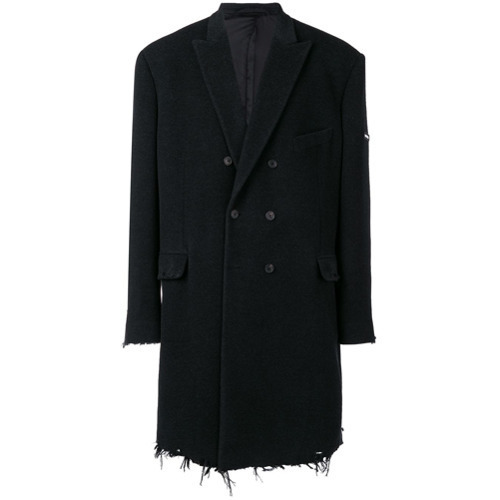 Marry a Balenciaga distressed double breasted coat with black dress pants like a true gent. Grab a pair of tobacco suede desert boots to make the ensemble current.